"With some people coming tomorrow night," I thought, "I had better cleanup." I got the apartment building's shared vacuum cleaner, and innocently turned it on, not anticipating the maelstrom that was about to immediately ensue. In a violent outburst of noise, dust and bits and bobs exploded out of the top left corner of the vacuum cleaner's plump bag, forming a brown mushroom cloud. A veritable torrent of dust was unleashed. The hazy dust cloud covered the entire room with every other apartment's dirt. I stumbled through the gloom to the door, only to be greeted with the piercing screams of the smoke alarm. "Thank God I started with Paulus's room," I thought. After powering off the dangerous machine -- not yet having actually vacuumed anything up -- I removed the still full bag and took it out to the dumpster to empty it. Out came a mountain of dust, lots of long black hair, and a couple of used contraceptives. I was glad they had not blown out of the bag. I reflected on the bag's crude design. You practically needed to be a mechanic to open it. That may have explained why it had apparently not been emptied for some years. Only a clever genius must understand why its design was patented. 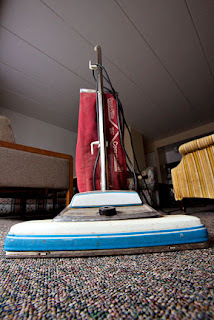 As I stomped flat the bag's metal flap to close it up, I pondered the vacuum cleaner's incredible sucking power. It sucked like there was a tornado in town. That was it then, its name had to be "el tornado". * I am kidding about starting in Paulus's room. And the contraceptives also. But everything else is true! In 6 minutes and 40 seconds the Navy presents a series of often very good quality photographs in combination with a couple of musical tracks. Featured are a variety of men and women of all ages, either working in the Navy or being helped in some sense by the Navy. There are lots of smiling faces—former President George Bush, film star Halle Berry, and even a dolphin make an appearance. Strikingly, however, while there are plenty of weapons, there are no victims of those weapons shown. The only reference I noticed to a U.S. casualty in 2006 was that of Paul J. Darga, who was killed in Iraq on August 22. He was symbolized by a gun and helmet. He is one of 3,166 U.S. armed forces deaths in Iraq so far. The people the US armed forces fought against in 2006 are not featured, with the exception of one photo. Here, a few suspects (as the caption describes them) were alive, but in a submissive state. There were no human bodies penetrated, bowdlerized, impaired, disabled or pulverized by weapons. I have asked the Navy if this is part of their operational guidelines when producing such materials. Perhaps they will respond. For whatever reason—and there could be plenty—the gruesome reality of violence and death is hidden, replaced by smiley happy people. If all the Navy did was rescue people, that would be ok. But part of their reality is killing and injuring people. Part of their reality having the same done to their personnel. This reality is missing in action from their year in review. My friend Eliyahu McLean hosted the noted reggae singer Pato Banton in his home in Jerusalem. Pato is described as a "conscious UK reggae artist", which makes sense when you hear his songs. This song is inspiring! Hajj Ibrahim is there to enjoy things -- of course. Video made by CaseyYurow, Youtube. The religious peacemaker Eliyahu McLean let me know he was hosting a Sikh tour of the Holy Land, and he invited me to join them throughout their travels. I joined them when they visited Rabbi Froman in Tekoa. Sikhism is one of the world's newest religions, and Judaism one of the oldest. One is from the Punjab in India and the other Jerusalem. Both have about twenty million followers each, and both have experienced more persecution than they have the intoxicating glories of political and territorial rule. While the orthodox followers of one like to wear loose white clothes and the orthodox followers of the other like to dress in formal black suits, they both admire long flowing beards very much. It promised to be an interesting afternoon and evening. The delegation of Sikhs numbered about twenty. They were all Orthodox: they faithfully followed their tradition of kesh (keeping their hair uncut) and wearing a kara (steel bracelet). One of them assured me they also wore the kangah (wooden comb) and the kirpan (ceremonial dagger), albeit a small version “so as not to cause problems with security.” They take this tradition very seriously, wearing their dagger even when they sleep. However they were not wearing what would strictly be considered kachha (short pants). I imagine this was a concession to modesty than for any profound religious reason. Upon boarding a small bus to visit Tekoa I found the Sikhs sitting contentedly, their tall trim bodies filling the small seats. All but two were men. Some were already in a trancelike state, an impressive undertaking given the formal prayers had not yet started. Eliyahu later confided they had been up all night travelling and were probably just exhausted. The Muslim peacemaker Ibrahim was there sitting at the back of the bus with his usual big smile and traditional Arab garb. Last time Ibrahim and I were on a bus he would take every opportunity to tell the young Israeli soldiers stationed at numerous checkpoints that they looked like one of his ten children and that they were beautiful. The soldiers invariably broke into a big smile themselves when he told them that, their tension spontaneously transformed into genuine joy. The settlement of Tekoa is reputed to be the land of Prophet Amos. It is close to the Palestinian village Tekua. Mt. Herod sits silently nearby. Tekoa is in an arid part of the West Bank, beside a series of spectacular valleys heading down to the Dead Sea. What few trees survive without be watered by people are undoubtedly old and hardy. We arrived in Tekoa to find an Israeli soldier guarding the entrance. Rabbi Froman is a man of peace but his village still relies on the military for protection. Froman joined us on the bus with greetings of “shalom salaam”. He said in Jewish and Islamic traditions, shalom and salaam respectively mean both peace and “the very name of God.” Thus the land of peace is the land of God, according to both faiths. We were guided to the edge of the settlement, overlooking the inspiring hills and valleys. Jordanian hills could be seen in the distance. A dry riverbed (known as a wadi) wound its way through the valley floor below. Off in the distance an isolated settlement sat, its distinctive red roofs signifying it was Jewish. Although it looked peaceful, the existence of settlements like this are perceived by many Palestinians, Israelis and international observers as one of the three major causes of conflict between Palestinians and Jews, along with Palestinian refugees demanding they be able to return to their villages they left during wars during the 1948 war, and the status of Jerusalem as a capital city claimed by both Israelis and Palestinians. Amidst laughter and joy the Sikhs' leader and Froman began to swap religious insights and stories, using the geography of the land and their respective religious culture for guidance. Ibrahim looked on as the Jew and the Sikh conversed. But before this interreligious dialogue Rabbi Froman thanked the Sikhs for their remarkable hospitality at the 2004 World Parliament of Religions in Barcelona, where they fed the 8,000 participants free meals. Froman said Jews have strict dietary requirements, and confessed with a happy smile that the enormous Sikh tent was the only place in all of Barcelona they could eat. He apologized for not preparing a tent for the Sikhs. The Sikh leader said that on the contrary, the land itself was a big tent, where they shared the love of God. Froman said “yes, yes, the love of God.” The Sikh leader said they had come simply to pray, to love each other and seek peace. He added that we become wise by serving God and serving his people. A young Sikh alone surveyed the land quietly as the sun hovered behind him, a land described by Froman as currently being in a “miserable” state because of the conflict between Jews and Palestinians, one of the few political references shared between them. Jewish tradition holds that the wadi that runs from Jerusalem (a point of life) to the Dead Sea (a point of death) is special, for at what Froman referred to as “the end of days” the Dead Sea will receive the water from Jerusalem and become a sea of life instead of death. Froman also outlined a story from Chronicles, near the end of the Hebrew Bible where enemies are defeated not by power and force but by love, humility, and by singing to God and praising him (God was always referred to in the masculine sense by both Froman and the Sikhs). The Sikh leader then recounted a Sikh story which had a similar perspective on the need to praise God. These observations reminded me of the complex nature of religious thought. While praising the God present in all people as being higher than one's limited self is a fine thing—or put it in non-religious terms, to live for the good of others and not just yourself is wonderful—to live responsibly does not mean abdicating reason to a vain hope for what Karen Armstrong calls “miraculous intervention”. She points out the danger of “a form of religiosity that reduces spirituality to magic.” Religious stories will always need wise interpreters, it seems. After the two religious leaders shared spiritual insights, emphasizing a universal spiritual identity above that of their identities as faith leaders, the Sikhs lead a session of prolonged prayerful singing. The Sikh leader and Froman sat side by side, emphasizing their unity and perhaps even their status as leaders in their respective communities. Two thirds of the way through the sun began to set, and Froman excused himself to perform traditional sunset prayers while the Sikhs continued to sing. Their different voices of prayer came together, the unity in diversity clearly apparent to everyone present. He then joined them once more, this time in a particularly enthusiastic round of singing the praises of a wonderful God, his body swaying back and forth. As they all sang together the religious intensity became greater and greater, the men's voices rising in volume and quickening in pace. After the devotional singing the men and woman talked among themselves. I conversed with a Sikh born in 1941, a humble man with a sharp mind. Many of the Sikhs in the delegation appeared to have roots in Kenya. There are something close to 500,000 Sikhs living in England, according to my interlocutor Sikh, who is leader of a Gurdwara (Sikh religious temple) in England. When I asked if it made sense to ask an Orthodox Sikh if they had a favorite Guru among the thirteen who founded Sikhism, he said it did not, as they regarded all of them as one. In response to a question of mine, he said the idea of Khalistan (an independent homeland between India and Pakistan for Sikhs) was one formed by the “propaganda machine” of India, and that his party was religious and not political, having nothing to do with the Khalistan movement. However he was familiar with a political figure associated with that movement, Singh Mann. He did not know of the Indian independence leader Khan Abdul Ghaffar Khan, being much more familiar with figures like Jomo Kenyatta, having instead grown up in Kenya and experiencing its freedom struggle. On the way out we visited a Yeshiva (school of religious learning) in the settlement. There were an impressive number of students and many of them were studying in small groups. They were all very enthusiastic to meet the Sikhs and talk with them. One thing about the beards, flowing garments and turbans of the Sikhs is that they immediately make them stand out from the crowd, even in a place rich with religious symbolism like Israel Palestine. When back on the bus I felt a sense of great peace and calm among these religious Sikhs. Their very presence conveyed peace in our often hurried and turbulent world. The next day I heard a well-known Israeli peacemaker who is non-religious describe an experience where Froman was in the back of his car, presumably lost in prayer, completely oblivious to the vigorous political discussion taking place around him. Whether one admires religious peacemaking efforts like this, or finds it archaic, naïve or worse, it is undeniable that the religious figures see themselves playing a valuable role in bring peace to this land. It might be that the mere fact a variety of Palestinians and Israelis witnessing such figures may be an experience that stays with them for some time to come, perhaps even influencing their thinking. Perhaps sessions of prayers and singing gives them legitimacy in the eyes of the religious. Whether it not the actual act of prayer and singing contributes to a culture of peace is a research question where gaining evidence is not easy. It has been said by some that “denial is not just a river in Egypt”—and this was powerfully illustrated on the bus ride to and from Tekoa. The Israeli man acting as tour-guide pointing out the sights on the way from Tantur to Tekoa began pointing out places where “Palestinian terrorists” had been shooting and murdering innocent Jews. He referred to Israeli settlements not as settlements but as towns. Just six weeks before his son's girlfriend was one four young people murdered by unidentified Palestinian gunmen not far from the road where we turned off to go to Tekoa, an tragedy that generated a lot of news coverage and led to the closure of the West Bank by Israeli authorities for some days. On the way back, the Israeli man again at some length talked about Palestinian terrorism, pointing out places where the Israeli State had placed protective barriers to minimize the effects of sniper fire from Palestinian villages neighboring the road. Not once did he talk about Israeli violence against Palestinians. In private I asked him why he believed the killings were taking place. He replied by saying the Palestinians had a culture of violence. Behind his back, Eliyahu just rolled his eyes and smiled. When I pointed out to the Israeli man that three times as many Palestinians had died compared to Israelis since the start of the second Intifada, he said that was because Palestinians were killing each other in intra-group violence. He said that Palestinians like to fire guns at weddings and funerals. In short his message was: Palestinians are violent and Israelis are innocent of any wrongdoing. Eliyahu mentioned quietly to me that the Sikhs would be visiting Bethlehem later in the week, where they will hear Palestinian perspectives. The tour-guide when not talking about Palestinian terrorists did usefully point out that some of terraced fields we were passing by in the minibus had been dated as being between 3-4,000 years old by archaeologists, with ancient olive trees also present. I must confess I was surprised that one of the Sikhs present was a professor at the University of London, who said he was a friend of the late Edward Said and of Noam Chomsky. He said he edits the journal Social Identity and is a specialist in post colonial theory, including sub-altern studies.